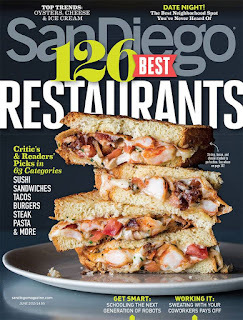 San Diego Magazine will celebrate its annual Best Restaurants issue with a kick-off party at Pirch at Westfield UTC on Wednesday, June 10, from 6:30 - 8:30pm, and SanDiegoVille has a chance for one lucky person to win two passes to attend! Now in the fourth year, the Best Restaurants Kick-Off Party celebrates the top restaurants in San Diego as selected by San Diego Magazine readers and food critic, Troy Johnson. The Best Restaurants Kick-Off Party will showcase hand-selected restaurants from the 2015 winners who will serve tastings of signature dishes. Guests can expect a variety of cuisines along with beer from Stella Artois, local wineries, desserts and live entertainment from DJ Daniel Peterson. Participating restaurants serving dishes at the party include Bottega Americano, Bracero Cocina de Raiz, Casanova Fish Tacos, Donut Bar, Herringbone, Le Parfait Paris, Puesto Mexican Street Food, Royal India, Searsucker, Solare Ristorante, Supernatural Sandwiches, The Marine Room, The Patio on Goldfinch and The Red Door. Tickets to the event are $60, which includes unlimited tastings, and can be purchased online. The La Jolla Music Society is offering a special promo code for $10 savings on the event - enter LJMS at checkout for savings on each ticket! The June issue featuring the Best Restaurants list is on newsstands now. For more information, visit sandiegomagazine.com.